All in blue: That’s how the Audi Piazza looked today, Tuesday. The reason for this was a row of emergency vehicles and many volunteers from four regional local associations of the German Federal Agency for Technical Relief (THW). They were guests at the Audi Forum in Ingolstadt to inform Audi employees and interested visitors about their work, to demonstrate the various equipment they use, and finally to receive a total of 20,000 euros in donations from Audi. 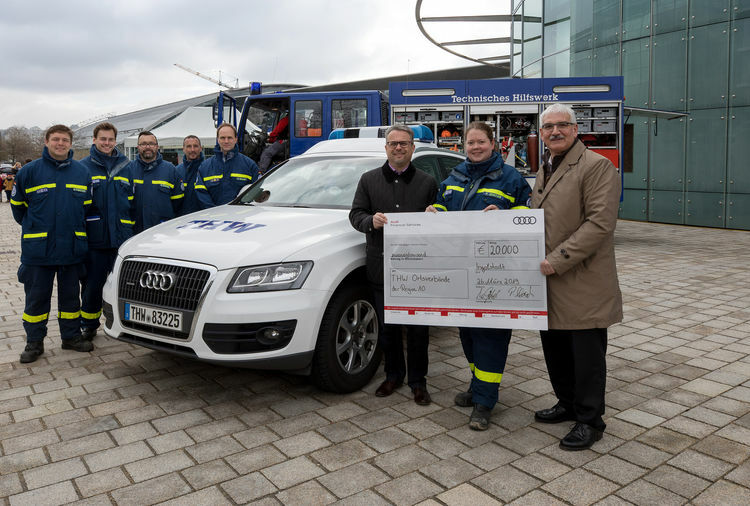 Whether contributing towards the purchase of, for example, a crew transport vehicle or a rescue tent, the automobile manufacturer is supporting the THW local associations in Ingolstadt, Neuburg/Schrobenhausen, Eichstätt and Pfaffenhofen with donations of 5,000 euros each. Wendelin Göbel, Audi Board of Management Member for Human Resources, and Peter Mosch, Chairman of Audi’s General Works Council, presented the symbolic donation check to the four THW local representatives in the Audi Piazza on Tuesday. Alexander Müller, local representative of THW Pfaffenhofen, thanked both of them on behalf of all THW local associations: “It’s nice to see that people and companies in the region like Audi appreciate the honorary commitment of my colleagues. We are investing the donations in new aid materials to be even better equipped in dangerous situations.” Following the presentation of the donation, Audi employees and interested citizens were able to obtain information at the THW stand and to view the exhibition with three trucks, an emergency vehicle, a master tent and a pump with a capacity of 25,000 liter.